Role of kinase inhibitors in various diseases is well established and discovery of imatinib opens up new paradigms in kinase inhibition. Furthermore, presence of heterocyclic moiety in a kinase inhibitor seems to be essential now. However, the potential of a single heterocyclic moiety was discussed in variety of reviews but a focus review considering the potential of different heterocyclic moieties is unavailable. 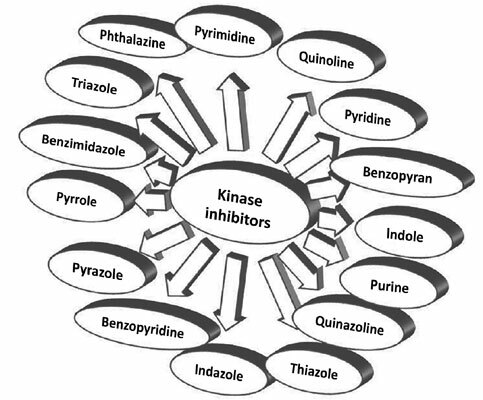 Based on this, we classify prospective kinase inhibitors on the basis of number of heterocyclic moieties present and summarize the prospective kinase inhibitors. Finally, important key points, current challenges and future prospects of kinase inhibitors are also discussed. Abstract:Role of kinase inhibitors in various diseases is well established and discovery of imatinib opens up new paradigms in kinase inhibition. Furthermore, presence of heterocyclic moiety in a kinase inhibitor seems to be essential now. However, the potential of a single heterocyclic moiety was discussed in variety of reviews but a focus review considering the potential of different heterocyclic moieties is unavailable. Based on this, we classify prospective kinase inhibitors on the basis of number of heterocyclic moieties present and summarize the prospective kinase inhibitors. Finally, important key points, current challenges and future prospects of kinase inhibitors are also discussed.